WFPG believes that providing the next generation of women leaders with the tools to succeed is the key to promoting women’s voices in foreign affairs. The organization provides a professional forum for women to connect with one another. Our roundtable discussions enable young women—both those in the work force and those still in school—to interact with leaders and role models in the foreign policy community. We believe that mentoring is a two-way street and WFPG encourages our members to engage across generational boundaries and benefit from each other's knowledge. WFPG offers a forum where women of all ages can broaden their networks, mentor those new to the field and be mentored by those who have come before them. Through Mentoring Fairs, career forums, and internships, the WFPG provides students and young professionals with the opportunity to meet with international affairs professionals to discuss career experiences and to learn first-hand what tools are needed to excel in their fields. 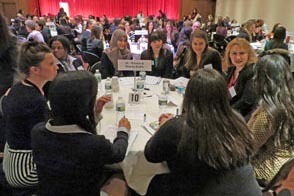 In addition to the organization's hallmark Mentoring Fairs, WFPG has organized numerous other activities over the years including career panels, a big sister program, career fairs and seminars. WFPG also offers discounted student and young professional memberships and competitive and substantive internships which equip young women with the skills needed to excel in the field of international affairs. WFPG's Annual Mentoring Fairs in Washington, DC and New York provide an opportunity for students and young professionals to meet with international affairs professionals and learn from their career experiences. The informal atmosphere encourages dialogue and enables students to ask questions and seek insight on the range of skills and experiences that would enhance their ability to enter and succeed in international careers. Mentors share their experiences from a variety of sectors including: the UN, Foreign Service, NGOs, international business, human rights, and national security.